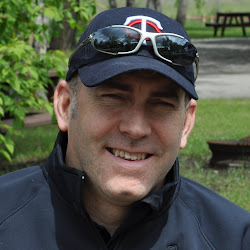 I’m a born and raised Calgarian, who has covered the NHL's Calgary Flames as a contributor to The Canadian Press since 1989-90. A graduate of the journalism program at Mount Royal College, when I'm not filing stories onto the wire, I'm posting analysis and features right here. Stop by, dig in, but don't take things too seriously, it's just hockey. This week at WinSport is the Flames annual development camp. It began Monday with an Amazing Race-like team builder. On Tuesday is fitness testing. Wednesday and Thursday will be a combination of off-ice sessions and on-ice skills development practices -- the latter starting at around 10 a.m. and happening in two groups. Then on Friday morning at 9:30 a.m., the week wraps up with a scrimmage and a first chance to see many of Calgary's newest prospects in a game setting. A total of 40 players will be in attendance. Twenty-four of them are already Flames property with the other 16 attending on a try-out basis. Of the latter, many already have their plans set for the 2017-18 season and are in town to see what Calgary is all about and to make an impression for later on down the road. For example, off-season signings Spencer Foo and Josh Healey were both at development camp a year ago on try-outs. There are also others whose plans for the fall aren't yet set in stone and are hoping they will do enough to impress the Flames brass that they will be asked back to Calgary's rookie camp in September. Typically, a couple skaters from this week will earn such invites. The breakdown is 25 forwards, 12 defencemen and 3 goaltenders. The contract of Stockton coach Ryan Huska has been renewed and he will once again lead the on-ice sessions. All three goalies are Flames property -- Tyler Parsons, Mason McDonald and Nick Schneider. All five of Calgary's 2017 draft picks will be in attendance. The lone representative from four years ago is Emile Poirier. Not at last year's camp, the 22-year-old is back this year after an AHL season that was cut short when he was granted a leave from the team for personal reasons. Full roster and schedule for the week can be found here on the Flames website. Not necessarily the best, oldest, most talented, or most NHL-ready prospects in attendance, here are eight players that intrigue me that I'll be keeping a close eye on this week. Officially inked on July 1, it was a week ago that the Edmonton native and highly coveted NCAA free agent decided that Calgary was the right fit for him. By right fit, this was a good news and bad news situation for Flames fans. The good news to the chagrin of puck pundits in his hometown three hours to the north was he chose Calgary because they're on the cusp of being a great team with a really good chance of winning the Stanley Cup. That was something that attracted Foo and surely were words that irked his Edmonton friends he grew up with! 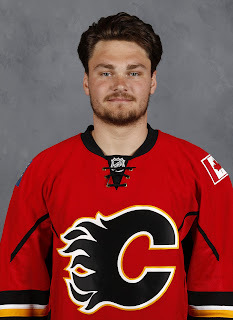 The bad news is he saw an opportunity with Calgary to either step into the NHL line-up right away, or at least very quickly, and that is not exactly a glowing endorsement of the Flames depth on right wing. Handed No. 15 and not the linebacker-like numbers typically handed out to prospects (or the No. 95 he wore at Flames development camp a year ago), Foo is someone to watch closely. After all, we're talking about a guy, who lit up the NCAA in scoring and was a Hobey Baker finalist. There's certainly the caveat that his breakout season came during a year in which he turned 23, but they are head-turning numbers that make you take notice. Described as smart, skilled, fast and with good vision, there will be opportunity for Foo to make the season-opening roster and he will make that oh-so-important first impression this week. I asked Spencer Foo if there's any player that has had a similar career path to what he hopes is in store for him and he said Jake Guentzel. He was the guy the Flames targeted at the draft and sure enough, he fell to them at No. 16 and Calgary wasted no time in pulling the trigger on the talented Finn, who they hope will be a fixture in the club's top-four at some point in the future. At the 2016 draft, the Flames were very interested in Valimaki's countryman Olli Juolevi, who went fifth overall to the Vancouver Canucks. Well, they got their Juolevi one year later in Valimaki, who packs many of the same attributes and is coming off an impactful second season in the WHL where he averaged over a point per game. 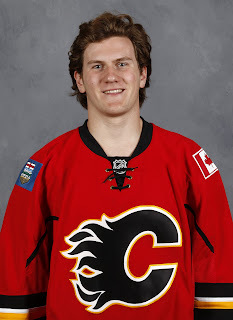 Valimaki came over to North America on his own in 2015. After his rookie season, he was joined by his Mom and his two brothers a year ago as they also came over from Finland. The home cooking worked as Valimaki was the fourth defenceman off the board and one of six Finns to be selected in the first round. Calgary is a team that prides itself on the quality of people in their organization, not just the quality of player. Valimaki is yet another. He captained Finland's U16 team, he captained their U18 team and this Christmas when he should be a key member of his country's world junior team for the second time, maybe he'll be wearing a letter once again. Known to have good speed and vision, like all players his age, next step will be improving his defensive game. If all goes well, a year from now, he could be turning pro. Two things stand out with D'Artagnan, who is the youngest of seven boys -- two of whom are also playing professional hockey. First there is his fantastic first name. Inspired by one of the lead characters in The Three Musketeers. As the story goes, when his mom was pregnant with him, they watched the movie and loved the name. The other is he had the good fortune of being drafted in the sixth round. With the exception of Austin Carroll, the seventh round for the Flames over the last several years has not amounted to much. e.g. Matt DeBlouw, John Gilmour, Riley Bruce. However, it's been quite the opposite for the sixth round with Calgary uncovering a bunch of gems that at least pack some intrigue. To refresh your memory, there was Adam Ollas-Mattsson three years ago, Andrew Mangiapane two years ago, Matthew Phillips and Eetu Tuulola last year. Well, add one more in Joly. A tall kid, who certainly will have to fill out, Joly is described as having a quick shot and is someone not afraid to initiate physically. When you get selected that late in the draft, there will be a lot of work to do and it's no different with Joly, but for someone who the Flames scouts were unsure of initially, they grew more fond of him as the season wore on. And you know he'll have lots of support from his siblings in working on the parts of his game he needs to improve at. It was a year ago at development camp when the Swede showed up a little too stocky in the opinion of general manager Brad Treliving and received a public scolding for his conditioning. By all reports, the message sunk in and working with Stockton's strength and conditioning coach, Alan Selby, it was an excellent first year of pro hockey for Andersson. The first year pro not only excelled on the ice, a fixture in the top-four at age 20, but put in the work off it. As the season went on, some weight was dropped while other extra pounds were turned into muscle through time spent in the gym. The team was satisfied with the commitment from Andersson and the strides he took and he even earned a late-season call-up and got into his first NHL game. If Andersson can continue on the upwards trajectory he is on, he could have a long NHL career in front of him. He has elite skills with the puck and continues to grow his defensive game. Not considered ready quite yet, one more season in the AHL and the conversation this time next year could be quite different. One area that took a bit of work was the tempo in his game and that's not uncommon as the AHL is a good and fast league and that jump from major junior is a big one, but that also evolved. A veteran of development camps with this being his third and likely his last, Andersson should be one of the leaders at this camp and you hope it's a responsibility he embraces. The Flames have not had a very illustrious history with Slovakian players. Only one of significance has played for Calgary and that was 1996 ninth round pick Ron Petrovicky, who reached the NHL at age 23 in 2000. The scrappy right winger spent two seasons with Calgary (9-12-21 and 139 PIM in 107 games) before being claimed by the New York Rangers prior to 2002-03 in the NHL's waiver draft, which was a real annual thing from 1977 through 2003. That said, interestingly enough, the Flames have added two Slovakian forwards to the organization in the past couple weeks. Most recently, it was the signing of 25-year-old free agent Marek Hrivik, who has logged 21 games with the Rangers and will compete for a fourth line role in training camp. The other, a few years away, is Ruzicka, the second player drafted by Calgary in the 2017 draft. The 37th ranked North American skater per NHL Central Scouting was grabbed by the Flames in the fourth round, 109th overall. He is coming off his first year in North America where the self-proclaimed power forward had a productive season that earned him second-team honours on the OHL's all-rookie team. Ruzicka has represented Slovakia internationally throughout his young career. He captained the U16 team, spent two years on the U18 team and scored a goal last year at the World Junior Championships. While there was some disappointment to see defenceman Brandon Hickey move on from the organization, that loss was tempered by the evolution of Fox, whose stock is on the rise after a sensational freshman year at Harvard in which he piled up the points. Fox also impressed for gold medal-winning Team USA at the World Junior Championships. While undersized, Fox more than makes up for it with a soft set of mitts that has him on the path to becoming a star offensive defenceman. Selected in the third round of the 2016 draft, Calgary was delighted to get him that late and that emotion has surely progressed to elation given how Fox has continued to develop his game. Is he big enough to win those battles in front and along the boards with those 6-foot-3, 210 pound forwards? It's not going to be easy for Fox given his stature, but once he does get the puck on his stick, you look for smart first passes or a speedy rush up ice. 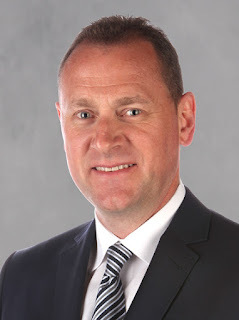 As an organization, the Flames want defenceman that can move the puck but also move their feet. Quick transitions and playing 'fast hockey' as Glen Gulutzan calls is the blueprint. Heading back to school for a second year, you won't see Fox in September so get in your viewings of him this week. The hard-nosed blueliner is yet another native of Edmonton, who has chosen to sign with the NHL organization to the south. After two seasons with Sherwood Park (AJHL), Healey went to Ohio State where he spent the last four years working on a Finance Degree. Coveted by several NHL clubs, Calgary prevailed and inked him to a two-year entry level contract in March after his NCAA season ended. He promptly reported to Stockton on an amateur try-out, getting into two games with the Heat. In a skills development setting like this week's development camp, Healey may not be as noticeable as you expect him to be in September at rookie camp when it's game time -- look out, Penticton! Healey has a lot of bullets on his resume including having quarterbacked Ohio State's power play but the one attribute you hear about more than any other is his reputation as a ferocious hitter. Suspended multiple times in college, he was even dubbed "The Next Scott Stevens" in this YouTube montage of some of his heaviest thumps. #Flames D prospect Josh Healey on his love of hitting: "Some guys want to score goals or make a sick play, I just want to blow some kid up." Learning the right time and place to make that thundering hit will all be part of the learning process but you know the front office is giddy about having a guy in the organization that packs that kind of snarl. Everyone is all-too-familiar with how long it's taken 2012 first rounder Mark Jankowski to ascend from NHL draft pick to finally being on the cusp of making the NHL. That same patience will also be required with Mattson. A player in many ways cut out of the same fabric as Jankowski, Mattson is a tall, lanky centre, who was drafted in the fifth round in 2016. The native of Minnesota and high school star has all the tools but can he put it all together? He is considered a long-term project, the next stage of which will be moving on to collegiate hockey in 2017-18. Coming from an athletic family in which one sister is a sprinter in college and the other plays volleyball, Mattson will be a freshman next season with NCAA hockey powerhouse North Dakota. The Fighting Hawks have made 22 appearances in the Frozen Four and have won the national championship eight times including in 2016. The good news when you're with a renowned program such as this one in Grand Forks is it means a lot of high-end competition and exposure, the challenge will be making an impact in what's bound to be a stacked line-up. By the way, have you liked Flames From 80 Feet on Facebook yet? Do so now! It's another way to be alerted to new Calgary stories I've written, other articles from my colleagues I enjoyed and I'll also sometimes use that space to weigh in on the news of the day. I'm glad to see that a number of the guys are RH as this team has so few RH. Like many here I wonder what went wrong with Poirier; I know that the Flames are respecting/protecting him through FOIP(I agree that they should)and all that but it sure interests me. We know for instance of Ferlands battles and McGrattin's battles. Whatever the reason is I'm hoping and prying that the young man has dealt with his issues and is getting the help he needs. Will you be doing a daily update on what you see at camp. Yes, you are prying... respect his privacy and cheer him on! Nothing announced publicly with Poirier yet but should be some more details this week. What about Linus Lindstrom? 6 points in 50 SHL games this year after 1 point in 4 last year, and was over a point per game in the SuperElit junior U20 league in Sweden as a 17/18 year old, and well over a ppg in his few games there this year before he was recalled to the SHL. Considering he was drafted at 6'0" and just 165 lbs yet already plays against men, could he be a good centre replacement for Jankowski in Stockton? It's worth watching him. 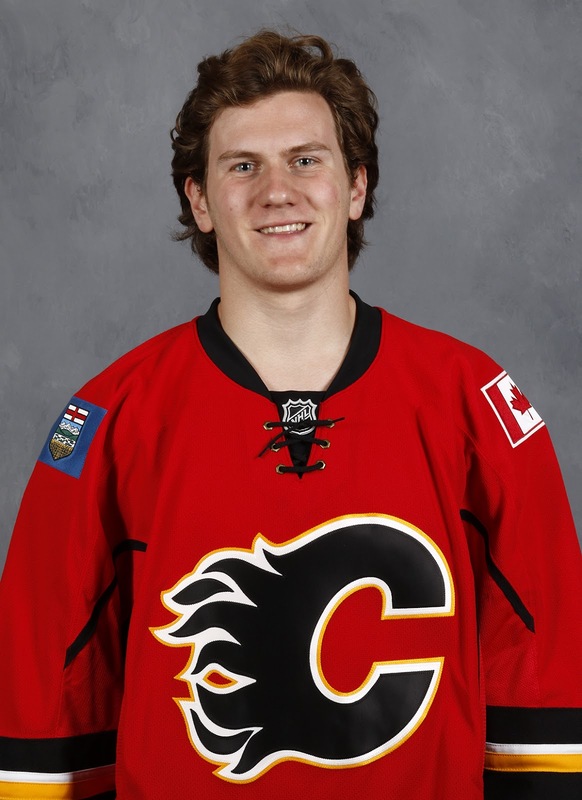 This is a year to watch for Lindstrom, who surprised Flames staff by staying up with the big team most of the year. Didn't get a lot of minutes in a 4th line type of role but that experience should pay off moving forward. Yes, will also keep an eye open for him this week. Not sure what his time line is for coming over to North America. May not be for a while yet. We'll see. Interesting to note that Spencer Foo picked the Flames because he would have a better chance at making the Flames; Ty Rattie signed by the Oilers picked them because it was his best chance to make an NHL team. (Mind you, that is after Foo had signed). After Foo signed, the Flames then added Kris Versteeg too. Roster situations are always fluid. But long-term depth isn't there in Calgary so you can see why Foo made the choice he did. For over 25 years, my home has been 80 feet above the ice surface at the Saddledome. As a contributor to The Canadian Press and member of the PHWA, you can find me in seat 15 in the east press box.